Today I did some research for my upcoming book with Prof Yves Pigneur: I went to a Border's bookstore in New York and browsed the business (strategy) literature for their visuals and design. Basic conclusion: except for the cover there are no to little visuals, even for the most innovative book contents. The most visual strategy illustration I found was in Kim & Mauborgne's blue ocean strategy book. It is part of their concept to allow for a visual comparison of the differentiation strategy of a company. 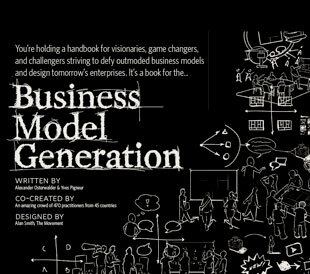 Though I do like their book, I believe it lacks the same visual creativity than all other strategy books. My nicest surprise during this little research was the discovery of a domain that makes great use of visuals: personal style. Look at the following photo & text. Wouldn't that be a nice illustration when talking about customer strategies and "personas"? The most notable exception in the field of business books was the one I bought. It's called The Art of Engagement - Bridging the Gap between People and Possibilities. The author, Jim Haudan, uses illustrations extensively in his book and uses them as a tool for engagement... not surprising. Though this lack of using visuals in business (strategy) books seems like a detail, I think it is essential when we are talking about strategy today. Strategies have to be communicated clearly. In today's complex world this is only possible through visuals that simplify the complex and make it clear. Visualization is also a technique that uses one of our most important senses - the ability to see. While it was difficult to include images in the early days of books, this is now different. 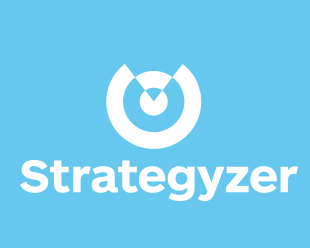 Why are strategy gurus still not making use of today's technology? In the context of my company, Arvetica, I recently recorded a podcast with one my favorite thinkers, John Hagel, who is Co-Chairman of the Deloitte Center for Edge Innovation, based in Silicon Valley. I am cross-posting the podcast on this blog because it would be a waste to miss John's interesting thoughts. Strategy approach: John emphasizes that all organizations should reassess their approach to strategy. He outlines an approach that departs from the traditional view of strategic planning which has a time horizon of 1-5 years. John proposes a strategy approach that operates in parallel on a long term time horizon of 5-10 years and on a short term time horizon of 6-12 months, with continuous iterations between them. He notes that this is the only way to avoid risks in high uncertainty environments. Unbundling the corporation: This concept highlights that most companies today are an unnatural bundle of three very different types of businesses: infrastructure management businesses, customer relationship businesses, product innovation and commercialization. Each of theses businesses has very different economics, skill-sets and cultures. Hence, companies should unbundle them. IT as a differentiator: John points out that IT is today becoming even more strategically important as a foundation for rapid incremental business innovation than previously. He explains this through new and flexible architectures which allow companies to continuously achieve IT innovation and keep a constant head start. This contrasts with the past, when companies made heavy punctual investments in IT innovations every few years, but were then copied. Finally, John also refers to the innovation potential of newer technologies that help people come together, collaborate and create value rather than just create savings through automation. If you are interested in John Hagel's work and thinking, you should imperatively consult his blog where he writes on various topics related to business and technology. You may also want to consult his latest book "The Only Sustainable Edge", which he wrote together with John Seely Brown. I will be speaking at the "Innovating the Business Model" conference organized by Enterprise Ireland, tomorrow, Wednesday 24th of October. I'm quite excited to be the closing speaker of the conference, since the opening speaker is Professor Henry Chesbrough, author of the books "Open Business Models" and "Open Innovation". I had a chance to meet Henry this evening and he is a really great guy. It's wonderful to meet one of the mentors of the open enterprise concept which we apply day after day at our consulting firm Arvetica. Last week I was in Mexico for Arvetica to facilitate two workshops on Business Model Design and Innovation. The first one was with a group of executives and the second one was with the faculty of the Tecnologica de Monterrey (ITESM). Both were organized by the well known ITESM. Throughout this first visit to Mexico I had the opportunity to meet some great people. I was very impressed by the strategic thinking and conceptual knowledge of industrialist, Jorge Valdes, of the Valsi and Evans brands and the quality of the people at the Tecnologico, such as Daniel Pandza and Maria Elena Vazquez. These two characteristics defy the conventional wisdom that you should either go for cost leadership or differentiation but not for both (remember Michael Porter...). In Kim & Mauborgne's terms this means that while Microsoft's Xbox and Sony's PS3 are fighting each other fiercly in a red ocean (i.e. 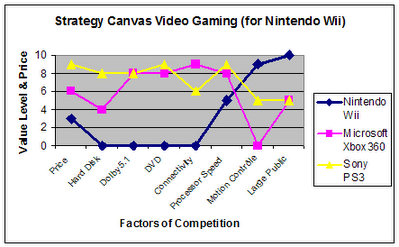 the existing market), Nintendo's Wii is calmly sailing in the blue ocean it created for itself (i.e. a new market)... By the way, Switzerland is not innocent as to the creation of this blue ocean: An Italy-based division of STMicroelectronics, which is headquartered in Geneva, Switzerland, has put forward to Nintendo the integration of motion sensors into their consoles.